Besides Matisse and Derain, other artists included Albert Marquet, Charles Camoin, Louis Valtat, the Belgian painter Henri Evenepoel, Maurice Marinot, Karl Pärsimägi, Jean Puy, Maurice de Vlaminck, Henri Manguin, Raoul Dufy, Othon Friesz, Georges Rouault, Jean Metzinger, Rik Wouters, the Dutch painter Kees van Dongen and Georges Braque (subsequently Picasso's partner in Cubism). The paintings of the Fauves were characterized by seemingly wild brush work and strident colors, while their subject matter had a high degree of simplification and abstraction. Fauvism can be classified as an extreme development of Van Gogh's Post-Impressionism fused with the pointillism of Seurat and other Neo-Impressionist painters, in particular Paul Signac. Other key influences were Paul Cézanne and Paul Gauguin, whose employment of areas of saturated color—notably in paintings from Tahiti—strongly influenced Derain's work at Collioure in 1905. In 1888 Gauguin had said to Paul Sérusier: "How do you see these trees? They are yellow. So, put in yellow; this shadow, rather blue, paint it with pure ultramarine; these red leaves? Put in vermilion." 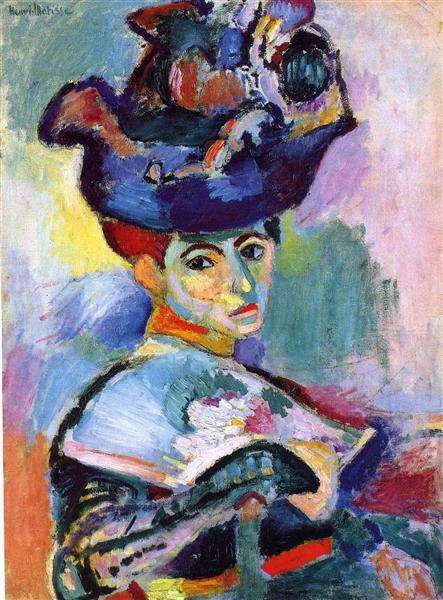 Fauvism can also be seen as a mode of Expressionism. In 1896, Matisse, then an unknown art student, visited the artist John Peter Russell on the island of Belle Île off the coast of Brittany. Russell was an Impressionist painter; Matisse had never previously seen an Impressionist work directly, and was so shocked at the style that he left after ten days, saying, "I couldn't stand it any more." The next year he returned as Russell's student and abandoned his earth-colored palette for bright Impressionist colors, later stating, "Russell was my teacher, and Russell explained color theory to me." Russell had been a close friend of Vincent van Gogh and gave Matisse a Van Gogh drawing.